ROXBOROUGH was a "small town" with goats in the pasture when Eileen Brown was growing up there with two sisters. After graduating from Dobbins High School, she became a nurse. She retired with a pension at age 62, but she never really stopped working . . . or raising children. She's now 80 years old and raising five children, ranging in age from 6 to 17. They are the grandchildren, great-grandchildren and great-great-grandchildren of her sisters, but there is no doubt they belong to Brown. She's one of the many older caregivers of children in the city, taking in the kids of family members who are unable to raise their own. 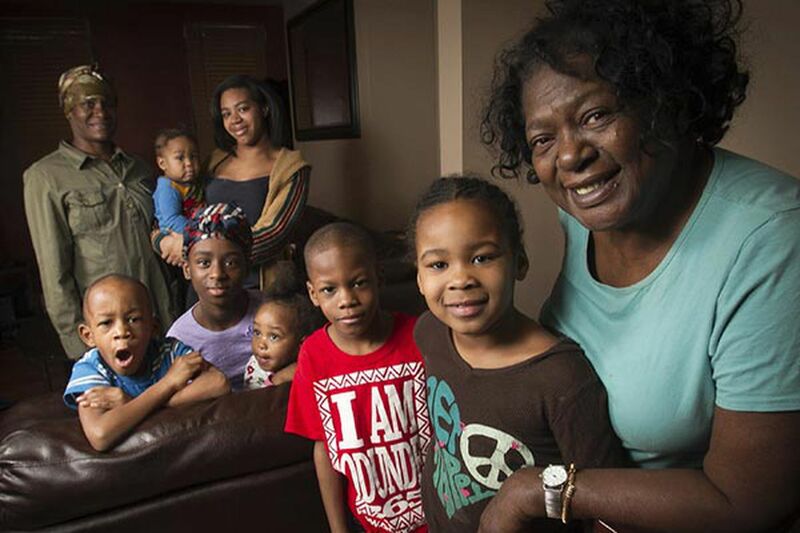 Grands as Parents, the organization that she helped found with other grandparents in a small office on Broad Street, estimates that one in 10 kids in the U.S. lives with grandparents. Taking care of children has defined her life; when she was younger, she took three kids (her deceased sister's children) under her care, got on a bus and took them to New York, where she found a nursing job. Brown eventually made her way back to Philadelphia, pulled in part by her family of parents who were unable to take care of their children. She took them in. "They deserved to have better," she says. "They could have all the love in the world and who could do that better than me? When the biological parents had problems, I didn't want to separate the kids. I made enough money to make it work." Not that it was easy. She needed help. One day, she walked past a church, went in and found a group of grandparents who were also taking care of young charges. "That's how Grands as Parents started," Brown says. "We spent every week in that church, and there was always someone that had it worse. I found people who didn't have the little that I have." In addition to lending support - and offering help to the larger community with food and clothing drives - Grands as Parents is fighting for more help from the state. A Senate bill is sitting in committee that would set up a pilot program to establish intergenerational housing. Also, in other states, grandparents and relatives are eligible to get money that foster parents receive. That's not the case here. "[The Department of Human Services] has a policy, to first find relatives of children [who need care]," Brown says. "Relatives have first priority, but they get no help. In Missouri, if you're a relative, you are compensated through DHS to be eligible to take care of children. Here, you have no rights." In addition to her pension and Social Security, Brown gets some benefits in the form of cash assistance and food stamps. It totals less than $1,000 a month for taking care of five kids. "I am so blessed, because I see a lot of children whose parents didn't get prenatal care, they have behavior problems, problems in school," she says. "I'm so proud of the young kids I have." When asked how she manages it all, she says simply: "This is my family. As the kids like to say, 'I got you.' "